O3 is a colourless, odourless gas at ambient concentrations and is a major component of smog. Ground-level ozone is not emitted directly into the atmosphere. It results from photochemical reactions between oxides of nitrogen (NOx) and volatile organic compounds (VOCs) in the presence of sunlight. High levels typically occur from May to September, between noon and early evening. Ontario Volatile Organic Compounds Emissions by Sector - 2012. Note: 2012 is the latest complete inventory. Emissions may be revised with updated source/sector information or emission estimation methodologies as they become available. Approximately 35% of the VOCs emitted in Ontario in 2012 came from the transportation sectors. 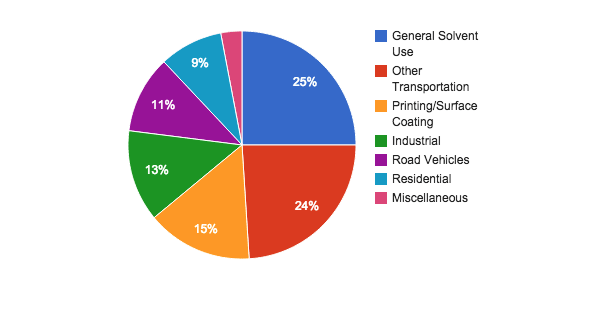 General solvent use and printing/surface coating were the second and third largest sources of VOC emissions, accounting for approximately 25% and 15%, respectively. (See list of sources of NOx sources.) Significant amounts of ozone and its precursors are carried into Ontario from the U.S. During periods of widespread elevated levels of ozone, it is estimated that more than 50% of Ontario's ground-level ozone comes from the U.S.
O3 irritates the respiratory tract and eyes. Exposure to high levels results in chest tightness, coughing and wheezing. People with respiratory and heart problems are at a higher risk. Ozone has been linked to increased hospital admissions and premature death. Ozone causes agricultural crop loss each year in Ontario and noticeable leaf damage in many crops, garden plants and trees. The Ontario Ambient Air Quality Criteria (AAQC) for 1-hour average ozone concentrations is 80 parts per billion (ppb), which has been incorporated into Ontario’s Air Quality Health Index to better protect Ontarians. For more information on how the Air Quality Health Index has been modified for reporting in Ontario, please visit the Frequently Asked Questions.